Did you just purchase your very first ukulele? 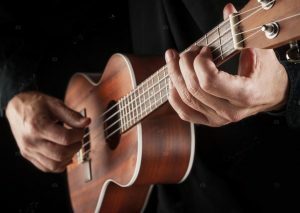 Do you have a ukulele but want to start learning to play? D’addario & Bananas At Large knows how important it is to get started on the right foot when you pick up your first ukulele. Especially for young learners, getting the right technique can be important for mastering more advanced ideas and techniques later. That’s why we are offering a FREE 30 minute introduction to ukulele class for new players! All attendees will receive a pic pack and be entered to win an amazing gift basket of goodies from D’addario! Drawings for the gift basket are done once per quarter and the next one will be after the June class. The goal is for you to start out right & get connected with your instrument! You will have an opportunity to sign up for lessons with any of our amazing teachers & get scheduled for regular lessons. Bring your ukulele with you or borrow one of ours if you’re interested, but haven’t purchased one yet! You will have an opportunity to browse and shop after the class!